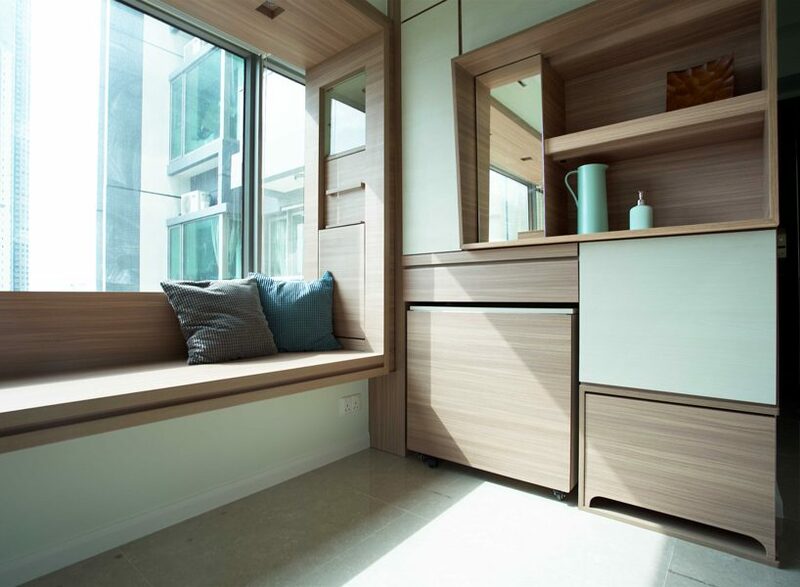 sim-plex has maximized the limited space of a 503-sf apartment in hong kong, by wrapping up the existing bay window with adjustable wooden cabinetry and furniture. the descent scenery of ‘bay house’ project’s surrounding has been framed and creates a harmonic atmosphere within the interior. the surrounding open scenery has been appraised by the clients, who are a young couple. 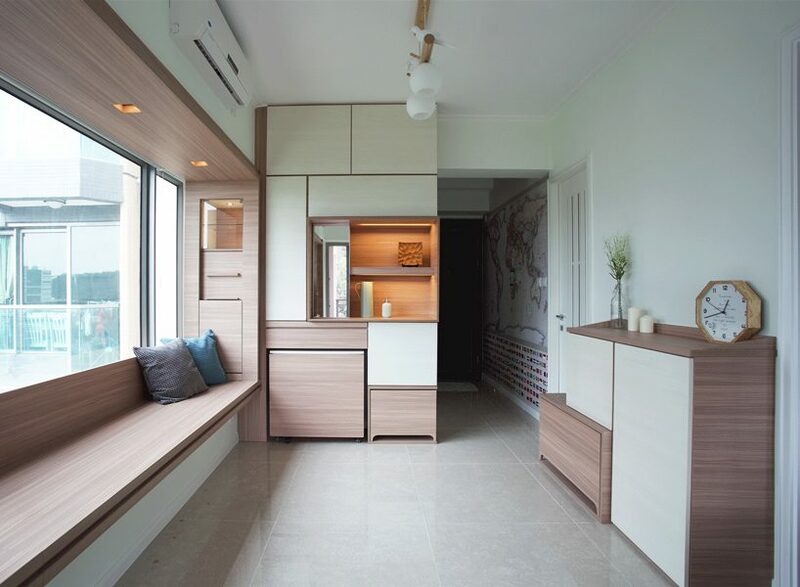 they have requested hong kongese based practice sim-plex design studio for a flexible arrangement of space which can fully utilize the bay window without obstruction of the scenery. ‘we want to bring the outer beautiful scenery into the apartment.’, according to the architects. the featured bay window becomes the spine of the apartment and is reinterpreted as a multi-functional picture frame which connects the scenery into the interior harmoniously. ‘the bay window in meaning was an expression of a bay to admit light into the interior. in hong kong, local real estate moguls enlarged the bay window as much as possible to exempt gross floor area. this apartment is one of the product in that period. however, this unique phenomenon was declined since 2012 as the update of the area exemption regulation. 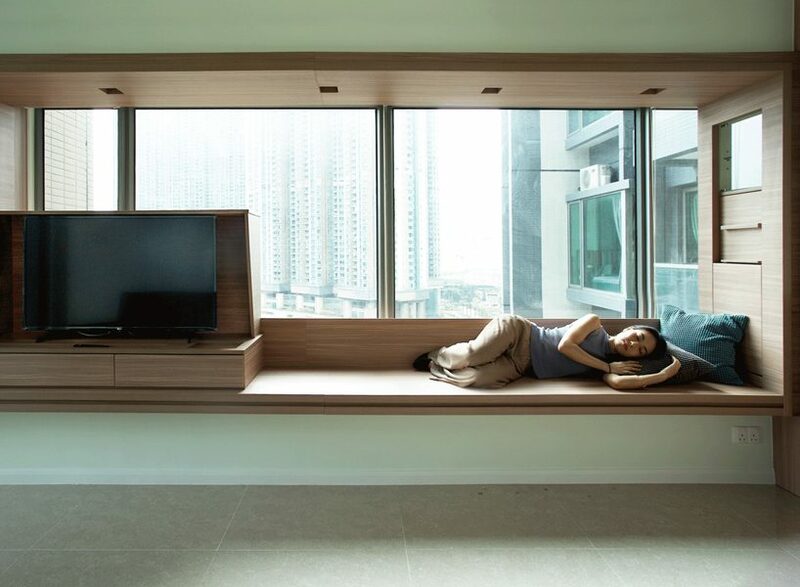 the supreme large bay window has become a monument in hong kong, is there anything our studio could do for it?’, says sim-plex design studio. in the living room, the TV set, a long bench, book shelf, display glass cabinet and lighting have been all integrated into the featured bay window. 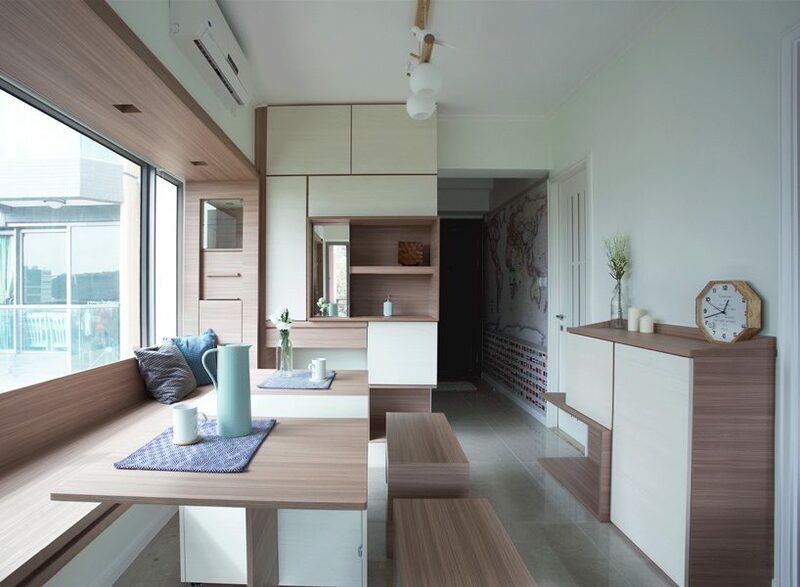 the full height cabinet and small shoes cabinet nearby served with adjustable dining table, sliding bar table and two movable benches. 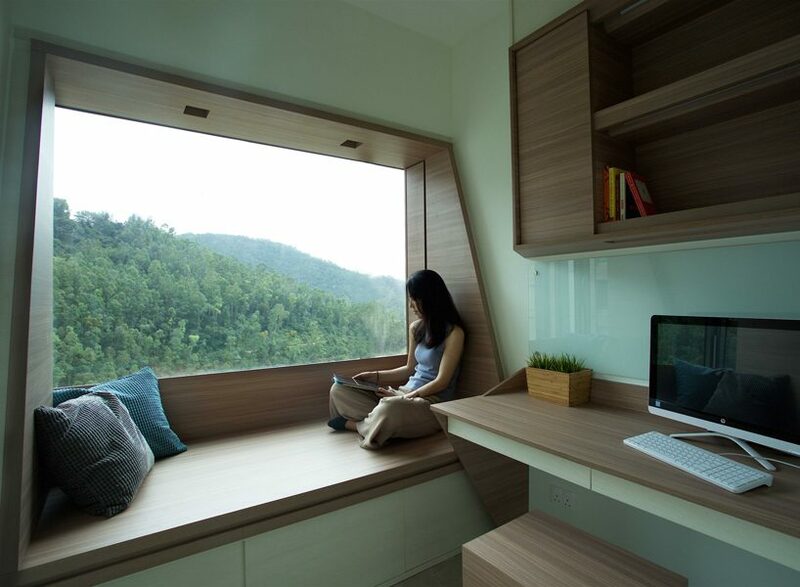 a tremendous living scenario has been created among this transformable furniture. in the guest room, the bay window is transformed into a wooden resting platform, framing the surrounding green mountain scenery. the room also features a working desk, book shelves and a glass magnetic notice board. 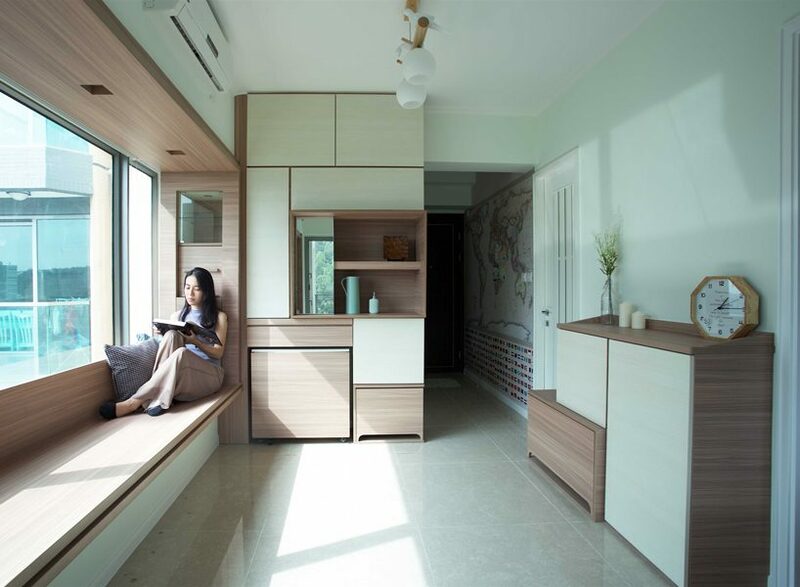 through the concept of transforming a bay window into a multi- functional picture frame, a unique and peaceful space has been created with a harmonious connection to the outer natural scenery.